Osa’ Amienyi is professor of creative media production and chair of the department of media at Arkansas State University. From July 2010 to June 2012, he served as interim dean of the university’s college of communications. He has been a faculty member since 1989, teaching a variety of courses at both the graduate and undergraduate levels, including communication theory and research, broadcast management, television production, media advertising and sales, and international communications. He has participated in numerous curriculum revisions at the both department and college and presented media sensitivity training to numerous non-profit organizations. From 2005 to 2007, he was chair of the Arkansas state university promotions, retention and tenure committee. In the last 23 years, he has participated on four strategic planning committees at both the university and college, during which the university’s mission, core values, and strategic priorities were defined. At the same time, he has participated in three Accrediting Council for Education in Journalism and Mass Communication (ACEJMC) re-accreditation of the college, each time as a member of the steering and coordinating committee, which wrote the accreditation self-studies. He is a former editor (1995-1999) of the regional Southwestern Mass Communication Journal. He is a former (1998-1999) president of the A-State Faculty Association and chairman of the Faculty Senate, during which time he worked with various constituencies on campus to formulate and direct university policies. 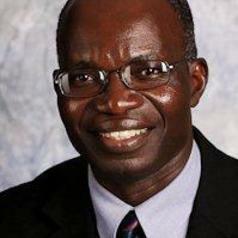 He is a proven scholar with several published research articles, book chapters and a book, titled Communicating national integration: Empowering Development in African Countries.